Today we’re kicking off a new series called My Favorite Liesl + Co. Pattern. Kelly is here to to talk all about the Weekend Getaway Blouse. The pattern has such a smart and clean design, no wonder it’s a favorite. Thanks for being here Kelly. Hi readers! My name is Kelly from Purple Workbench. I’m a mom, electrical engineer, and sewing enthusiast with a passion for hosting guests. I spend my spare time organizing retreats in a beautiful farmhouse in rural Ontario to encourage guests to make time for their creative pastimes. 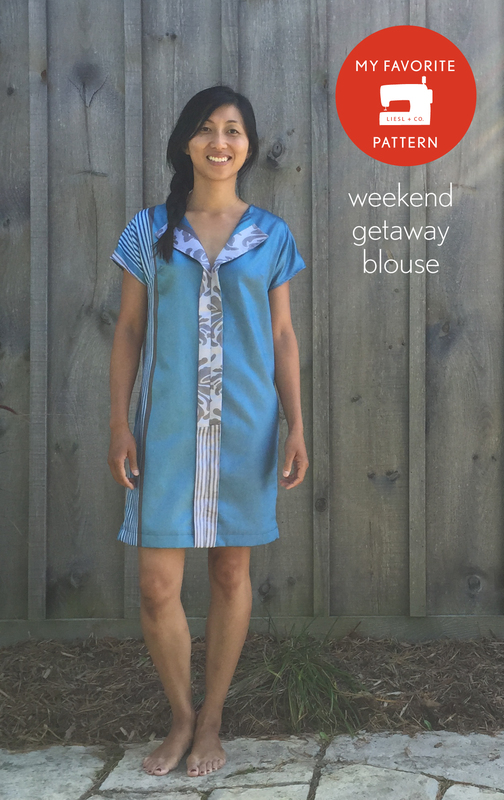 I love sharing my favourite sewing patterns with guests and Liesl + Co.’s Weekend Getaway Blouse is probably my most recommended pattern. There are so many things that are wonderful about this pattern. Let me break it down for you. Flattering. 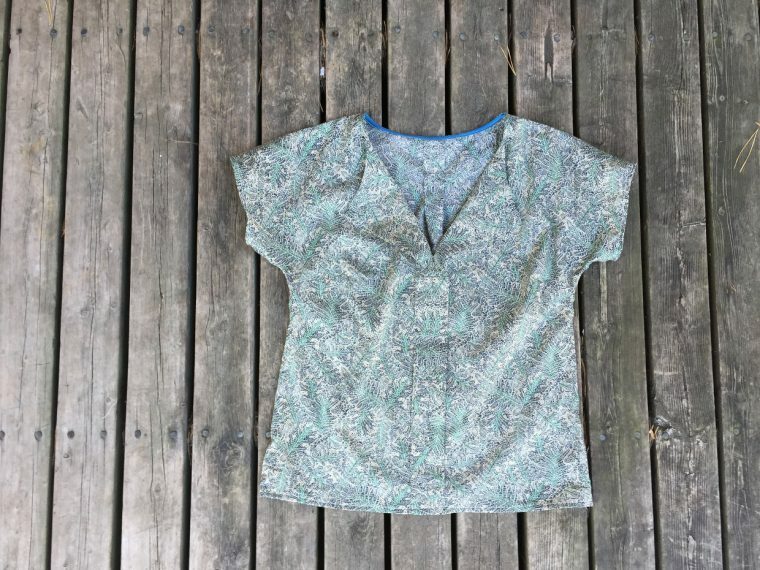 This pattern features a kimono sleeve and roomy midsection. It magically hides the wider mid-sections and a rounder shoulder. I also love that it’s both youthful and mature. My mother pulls it off so well and loves wearing it tucked into a pencil skirt to create a slim waistline. Versatile. It’s great for the weekend, but I love that it works well in the workplace, too. I’ve worn it tucked in, or loose over a pair of jeans. The pencil skirt formalizes it and a circle skirt gives a great whimsy look. Using cotton lawn adds a bit of structure (think dress shirt) and a rayon or silk charmeuse gives a soft flowing drape: both great choices for this pattern. Simple sewing. The kimono sleeve means no curved shoulder seam! Everything sews up easily but there are lovely details that also make the blouse look so professional. I have taught this pattern in private sewing lessons and find it is great for beginners! I can’t tell you enough how great a project this is! Oliver + S patterns are loved by so many because of the quality of design and instruction. This Liesl + Co. pattern is no exception. It’s also a good gift to sew up since the fit is quite forgiving. With few pieces to cut and simple construction, I always feel so satisfied after sewing this blouse. Perhaps enough to reward myself with a weekend getaway? Very inspiring! I love the blue dress particularly, great use of fabric design. I love everything you’ve sewn with the pattern! Thanks so much for contributing to this series. You and your mom both look great in this one! This is a pattern I’ve not been so drawn too, but your take and styling tips have absolutely made me thing about one or two blouses for work. Thank you. Love these variations. Is it possible to easily make the v-neck higher? 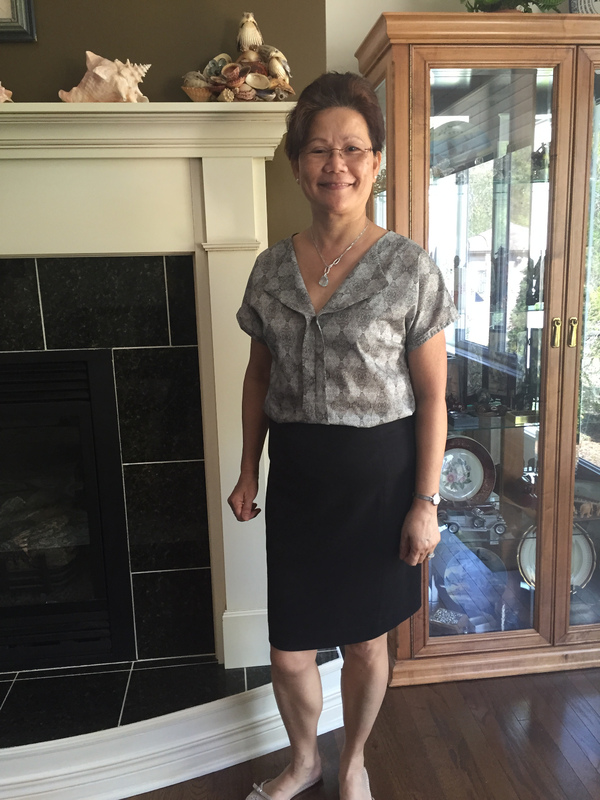 I’m almost 60 (yikes) and have a small (and bony!) above bust area and narrow shoulders and so v-necks are better higher for me. I’m looking forward to this series continuing. Lyn, absolutely! You can make it as high (or low) as you like by simply raising or lowering the front seam. It couldn’t be easier! I never noticed this pattern before. Now I’m going to take a look at it. Oh I love that dress with the red belt. It looks fantastic belted! I have a blouse and a dress version of this pattern, both sewn in a sheer silk chiffon and it’s fabulous in those really light drapey fabrics. Love your versions here and so happy to see this is someone else’s favourite too. I love this series! I was hoping you would do such a series on Lisel and co. patterns. Was delighted when Rachel announced it last week. Thank you! And thank you Kelly. I had assumed a pattern for a shirt would be too difficult but you have shown otherwise! Am adding this to my sewing list. What is the name of the fabric line that the dress with the belt is made of? After reading this post I purchased the pattern and made my first Weekend Getaway Blouse. I could not love it more! I followed the directions and did a FBA, and I am tickled with the fit. I already have another on the cutting table. Superb pattern. Do you think Double Gauze would lay well with this pattern? I love all of the variations above!